For Clarinet and Military Band. 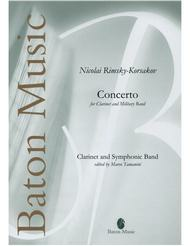 Composed by Nikolay Andreyevich Rimsky-Korsakov (1844-1908). Arranged by Marco Tamanini. Full score and set of parts. Duration 8:00. Published by Baton Music (BF.BM284-SET). After the performances of Rimsky-Korsakov's Concerto's for Oboe and Trombone and Military Band in 1876, the composer wrote: "My third and last composition of this character is a Konzertstuck for the Clarinet with the accompaniment of a Military Band". This important Concerto for Clarinet is now edited by Marco Tamanini for the instrumentation of a modern Symphonic Windorchestra.